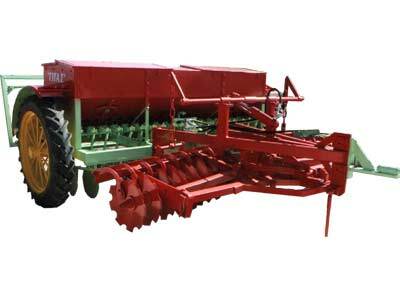 The type seeder machine GIGAS 2 seating up to 1200 pounds and comes and comes with Coulters and Discs diameter 38 mm (Special order in our factory) with axle and two bearings. It is available either sliding or appended. Furthermore can be adjusted in the front disc cultivator heavy type. Fully automated: Upload - Download and change angle hydraulic discs. Ability Sowing directly into plowed. 50% FUEL ECONOMY AND SALARIES Fully automated:: Put up - down and change angle hydraulic discs. Ability Sowing directly into plowed ground.